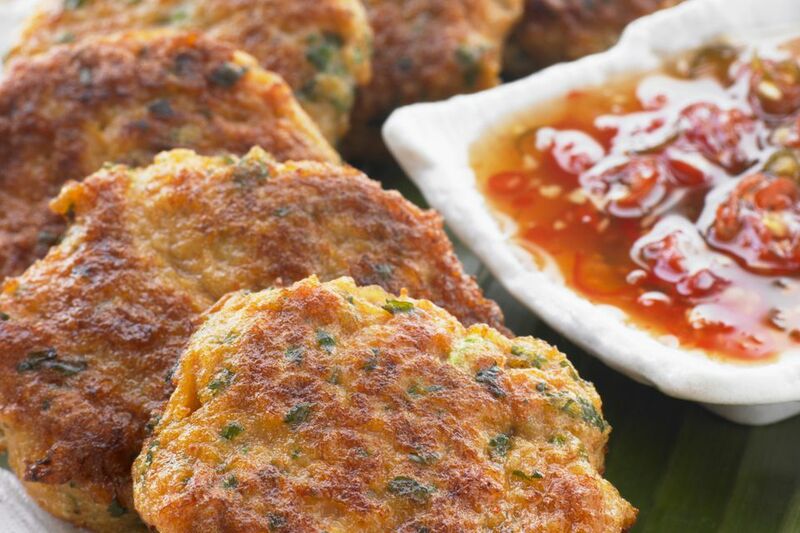 Thai fish cakes are a common street food in Thailand. Very flavorful compared to most Western fish cake recipes, they aren't battered, which allows for more of the fresh taste of the fish, spices, and herbs to come through. These cakes are best eaten right out of the oil while they're still hot and juicy. Serve them with or without rice, accompanied by Thai sweet chili sauce, chopped cucumber, fresh coriander, and a squeeze of lime juice. Simply delicious! Rinse fish and pat dry thoroughly. Cut into chunks and place in food processor or large chopper. In a small bowl or measuring cup, combine the coconut milk, fish sauce, chili powder, ground cumin, and coriander and brown sugar. Stir with a fork to combine, then pour into the processor over the fish. Add 1/2 cup breadcrumbs, kaffir lime leaf strips, green onion, galangal or ginger, garlic, and chili. Pulse to combine. You should be able to pick this mixture up in your hand and form it into cakes. If you find it too wet, add more breadcrumbs and pulse again until you get a good consistency. (Much of this will depend on the fish you're using and how much moisture it contains). Scoop up a small amount in your hand - about the size of a golf ball - and pat into a small cake and set on a clean plate. Note that traditional ​Thai fish cakes are small and not too thick (about 2 inches in diameter and 3/4- to 1-inch thick). It helps to rinse your hands every so often with cool water to prevent the mixture from sticking. Set the plate of cakes in the refrigerator for 10 minutes to firm up. Meanwhile, pour oil into a small frying pan or wok, at least 1 inch deep, and prepare your garnishes. Heat oil; when hot enough - a breadcrumb should sizzle and cook immediately when dropped in - gently set cakes in oil. Fry 30 seconds to 1 minute before turning, gently lifting cakes from the bottom of the pan. Fry until golden brown and drain on paper towel. Serve immediately with cucumber and Thai sweet chili sauce on the side for dipping. Top with fresh coriander and serve with lime wedges that should be squeezed over just before eating. Make Ahead Tip: You can make the fish paste up to 24 hours in advance. Cover and set in the refrigerator, then form into cakes and fry right before eating.